Notes from a teacher - and lifetime student - of public relations. In the PR Major this week, Laina Hughes gave a thought-provoking presentation on Lance Armstrong's recent announcement that he would give up the fight against doping charges (without admitting to the charges). It was natural, given the topic, that our discussion should turn to ethics -- and in particular, the ethics of communicating for a client who isn't telling the truth. To be clear: I am not suggesting (nor was anyone in the class suggesting) Mr. Armstrong has been lying about his innocence on the doping charges. If he is innocent, he is likely the only person on the planet who can say he knows this for certain -- and he's in the impossible position of trying to prove something didn't happen. The topic, however, raised the question: would you work to help a client deceive its publics, no matter how admirable the end goal (e.g. raising millions to cure a terrible disease)? Our personal values inform our sense of what's "right" -- objectively, what's "right" isn't always obvious. Most of us wouldn't consider accepting a job to help Charles Manson clear his name... even if he still claimed innocence. But it's not always that black-and-white: some of us are perfectly comfortable working to further the business objectives of a tobacco company, or a cattle producer, or a casino, or a logging company... others not. A PR professional has every right to draw her/his own line, and decide which clients (s)he is willing to take on. Your job is just your job; your beliefs and morals are part of who you are. You shouldn't feel you have to contradict them in the interests of a paycheque (there's always another opportunity for a paycheque). The question of whether we should be willing to lie on behalf of a client because we believe some greater good would be served by doing so isn't quite so tough. If I know my client is lying, I shouldn't help him/her/it do so. If the client is unwilling to be honest about the issue and insists that dishonesty is the only option, decline the role. If that means quitting, quit -- but don't let a client's ethics supplant your own. Public relations has become a management function in large organizations; our access to our publics has improved dramatically; the ways we work with influencers, journalists (in mainstream media and on blogs) and other stakeholder groups are evolving quickly with advances in technology and business practices. ... but there's still a long way to go. Despite PR's continuing evolution, there are still journalists who refer to our profession as "the dark side," and people who think PR is about fooling the public into thinking certain things and in certain ways. And every time someone using the tools of PR helps a client to deceive its publics, they're proven right. Professional PR associations like the CPRS, Public Relations Society of America, International Association of Business Communicators, International Public Relations Association and others around the world work to combat this by developing and promoting professional codes of ethics for PR practitioners. Each of these organizations' ethics codes requires members to promise to communicate honestly and with integrity in all their dealings. It's the only way our profession will survive. If journalists and our stakeholders at large can't expect us to tell the truth, there's no reason for them to believe anything we say. And if they don't believe what we say, frankly, we can't add much value. If a client wants you to disseminate information you know to be false, decline. If it means you have to leave the job and find another one, so be it. It'll be uncomfortable in the short term... but you'll be happier working for someone different, who doesn't put you in that position. Great blog post, Melanie. I would have loved to have seen Laina's presentation on this issue. Working in integrity, something that we should all be mindful of. The Armstrong story has taken more twists this week - we'll have to pick up the discussion on Monday! 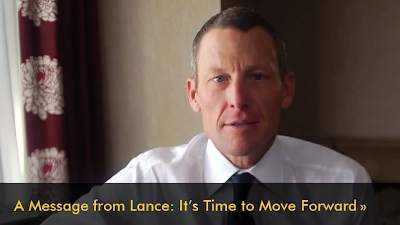 Bruce Arthur of the National Post wrote a great piece on October 23, The apology Lance Armstrong will never give. It's a fictitious apology from Lance and it's beautifully written. I think public opinion could start shifting with a simple and authentic "mea culpa" followed up with a I'm-going-to-be-the-change-I-wish-to-see Gandhi-esque type of statement. I own Lockstep Communications, a PR consultancy, and teach public relations in the Creative Communications ("CreComm") program at Red River College (www.rrc.ca). Follow me on Twitter @Lockstep. Opinions I express on this blog are my own. The opinions I express on this blog are my own, based on my 18 years of personal experience in the communications industry. They do not necessarily reflect the opinions of Red River College or of my clients. Blogging: who decides what's interesting? So I got stopped by the police again yesterday. I’ve Moved URLs. Come Join Me! Where is all the stuff?